Winners of the Dilly Dally in Dooly BBQ Competition were Grand Champion “Off the Chain” pictured left and Reserved Champion Rescue Smokers on the right. VIENNA, Ga. — The air was thick with the smell of sweet BBQ at Saturday’s Dilly Dally in Dooly. 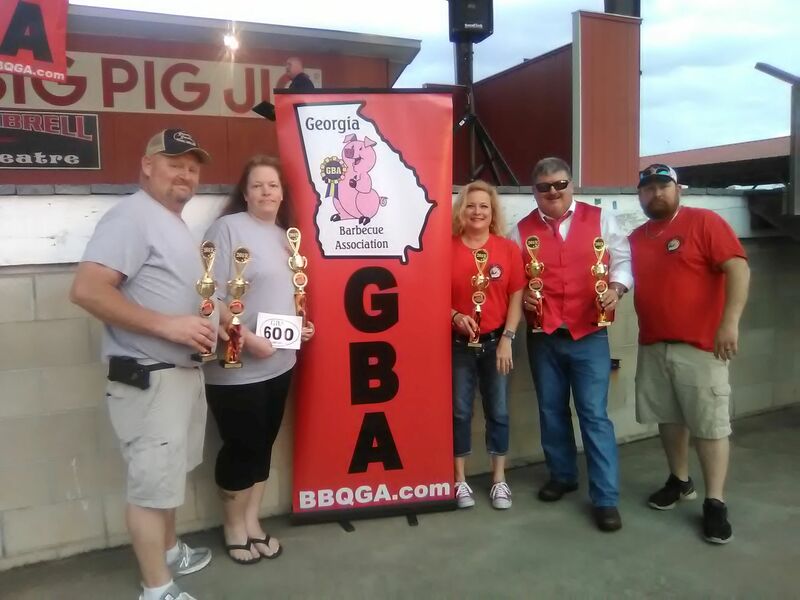 Fifty teams competed in the Georgia BBQ Association sanctioned competition vying for the coveted Grand Champion award and a shot at the GBA’s A.K. Saville Team of the Year award for 2018-2019. Teams competed in any combination of categories; Ribs, Loin, Pulled Pork and an ancillary category which was Brisket. Teams submitted their entries in each category for blind judging where they were critiqued by GBA certified judges. When the smoke cleared the emerging victor was “Off the Chain” from Social Circle, Georgia. They took home a prize of $2000 and a trophy. Reserved Champion went to the “Rescue Smokers” of Ashburn, Georgia who received $1500 and a trophy. The top two teams are ranked second and third place respectively in the current standings for the GBA. Pulled Pork: 1st Place – Big Butts BBQ, 2nd Place – The Pit Crew GA, 3rd Place – Southern Hogs/Dexter Meat Co. Ribs: 1st Place – Rescue Smokers, 2nd Place – Big Daddy’s Meat House, 3rd Place – Lang BBQ Smokers. Trophies and prize money were also awarded to teams placing in the top 10 for each category. The top three teams in the Loin category all received recognition for the “600 Club” which is an honor bestowed by the GBA to teams that score a perfect 600 from judges during the preliminaries in each competition. The Georgia BBQ Association is the second largest competition sanctioning organization in the State of Georgia with over 600 members and more than 400 certified judges. They sanction approximately 18-20 contests per year throughout the state. This was the third year of Dilly Dally in Dooly held at Big Pig Jig Village in Vienna. The city is most well-known for the Big Pig Jig, held each year during the first weekend in November, sanctioned by the Memphis BBQ Network. Throughout the more than three decades of the event walking the stage at the Stan Gambrell Amphitheater has become a coveted honor for many cook teams. That sentiment rang true among teams competing at Dilly Dally over the weekend. For more information on Dilly Dally in Dooly click here or the Big Pig Jig click here. To learn more about the Georgia BBQ Association or how you can become a GBA certified judge go online here.